We flew back to Singapore for a two week holiday. We were back in Singapore from 31 July 2015 to 14 August 2015. Raedon was having his summer holidays from his school in Europe during this period too. While we were back in Singapore, we caught up with family, friends, newborns and FOOD!!!!!!!! We miss the local food so much!!!!!!! 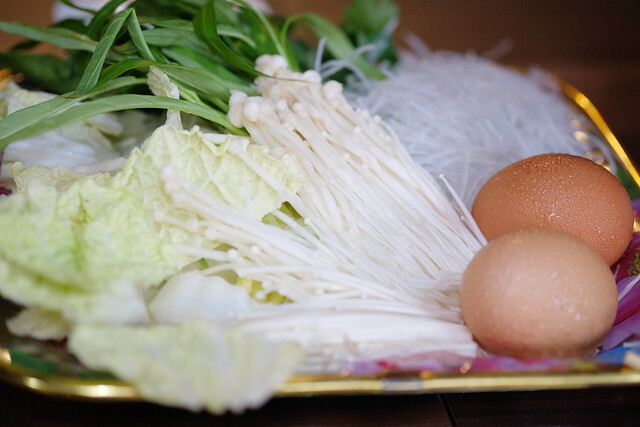 I do cook asian food at home but it is very difficult to get some ingredients here in Europe. So while we were in Singapore, we ate to our hearts content! I especially missed the food in BKK and we wouldn't be visiting Thailand for a long time. In Europe, we go to a Thai restaurant regularly but they only served Northeastern Thai food catered to the European taste. So in order to satisfy our authentic Thai food craving while we were in Singapore, we chanced upon the Thai Pavilion Restaurant which is located in the east. Upon arriving at Thai Pavilion restaurant, I noticed that the decoration is very thai style, with dark brown furniture, very cosy and very clean. The waiter was very hospitable too. I also heard that the chef is a Thai national too! One of the reasons why I love Thai food is because Thai food is never just spicy or just sweet; each dish has a good balance of sweetness, aroma, acidity and spice! 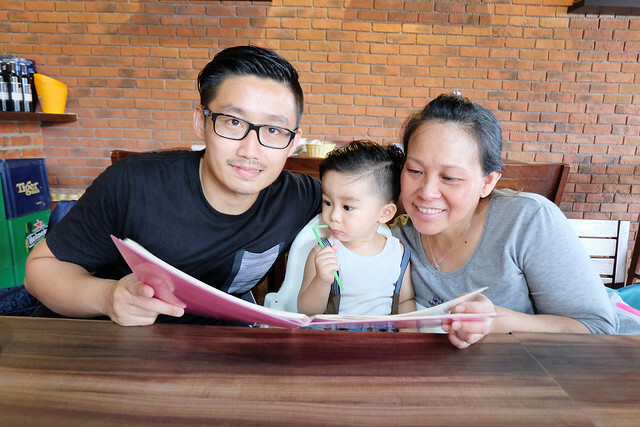 After we have settled down, Raedon, my husband and my mummy checked out the menu and they chose what they wanted to eat. We decided to have MOOKATA and also other cooked dishes at Thai Pavilion. 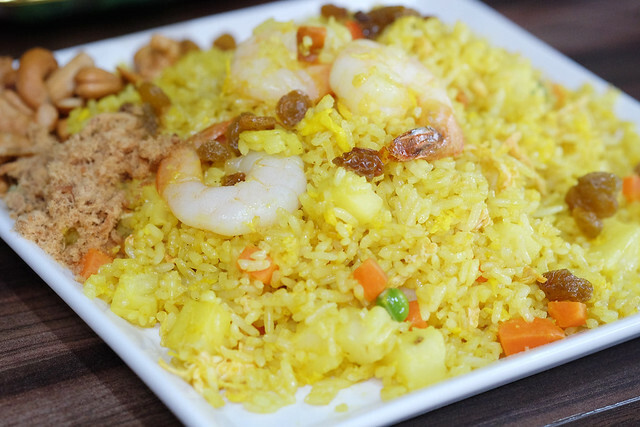 We ordered the Thai Seafood Pineapple rice and honestly, nothing beats chomping down the tangy sweet, juicy pineapples with the salted cashews. Next up they served us the vegetables for the MOOKATA. Honestly, the highlight of the MOOKATA is the dipping sauce!!!! Thai Pavilion makes its MOOKATA dipping sauces in-house, which requires lots of time and love. My husband and brother washed it all down with some chilled beer and went, "Ahh..... this is the good life!" 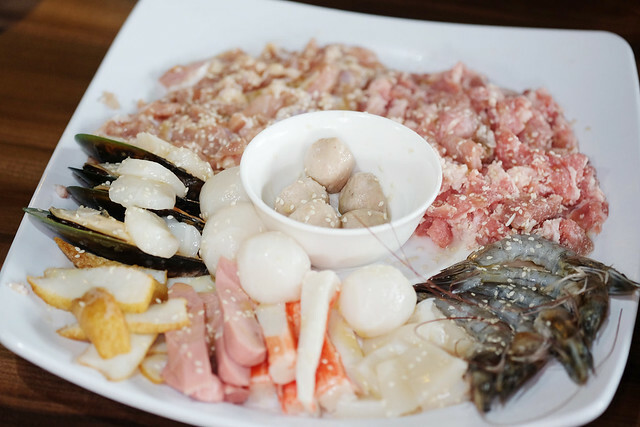 Thai Pavilion Singapore also served a range of well marinated meats and seafood for our MOOKATA! 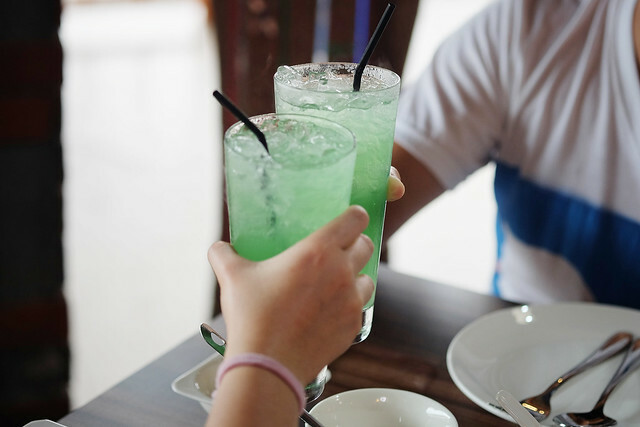 My sister and her boyfriend ordered the Thai Pavilion's lemongrass drink which was tasty as well as colorful. 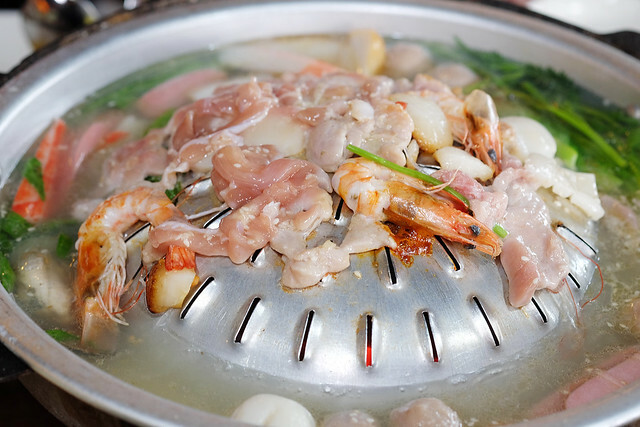 The waiter placed the soup and pieces of lard on the BBQ plate and then we were ready to start! I cooked while everyone feasted. My grandfather was eyeing the food eagerly too! My husband and my brother having an awesome time chit chatting and eating. Thai Pavilion also had a huge flat screen and they were playing the national day parade that day. We watched the SG50 celebrations while eating our dinner. 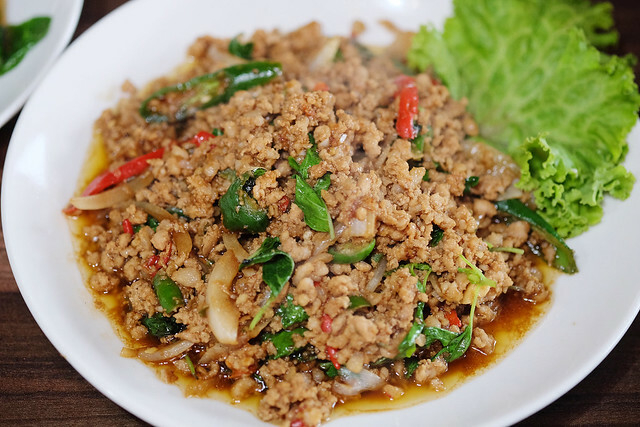 THIS thai minced meat with basil leaves is truly a fiery personality spiked with lots of hot chilli. 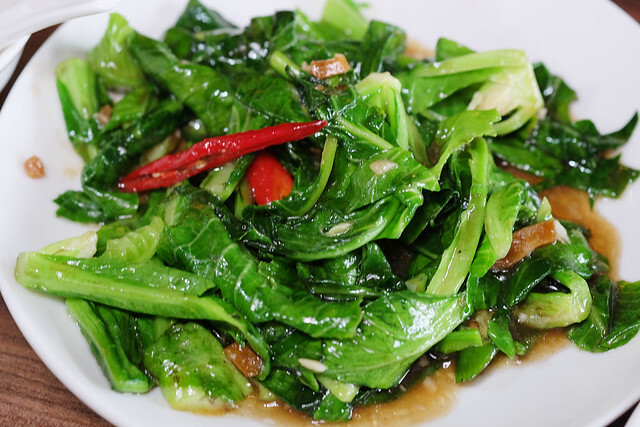 A simple dish of stir fried vegetables and chilli which is bursting with freshness and flavors. 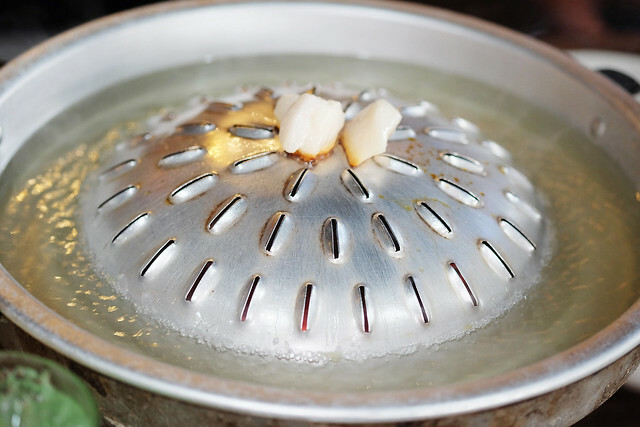 Thai Pavilion's tom yum soup is also served traditionally in a charcoal heated utensil. 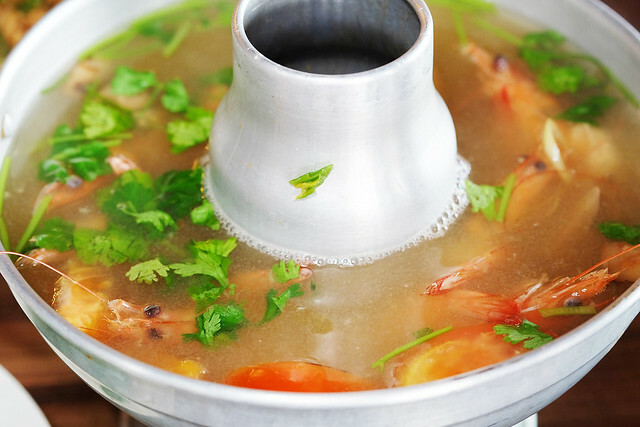 This unassuming lemongrass-laced broth is packed with so much seafood. Thumbs up to the people at Thai Pavilion for being so generous! 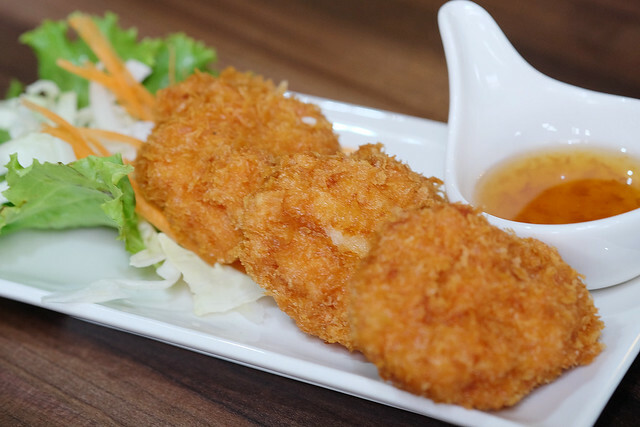 This deep fried prawn cake was fried to perfection with his sweet sour dipping sauce. 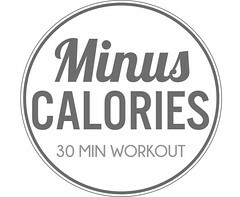 This one is a MUST try! It is my favourite dish. Even a fussy eater like my son, Raedon liked it and kept asking for more. 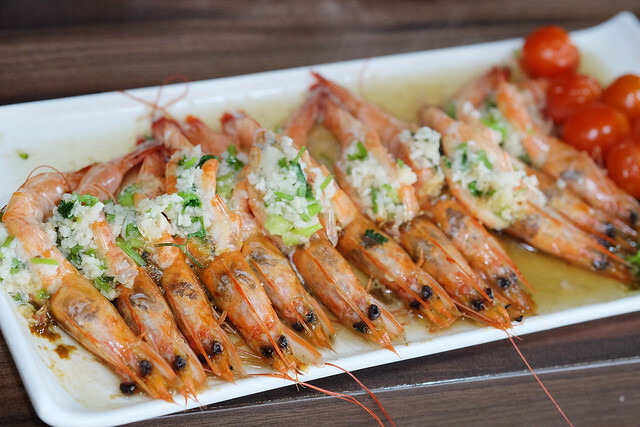 Thai Pavilion's steamed prawns with a side of cherry tomatoes is a good change from the spicy food. This is another one of my favourite dishes. 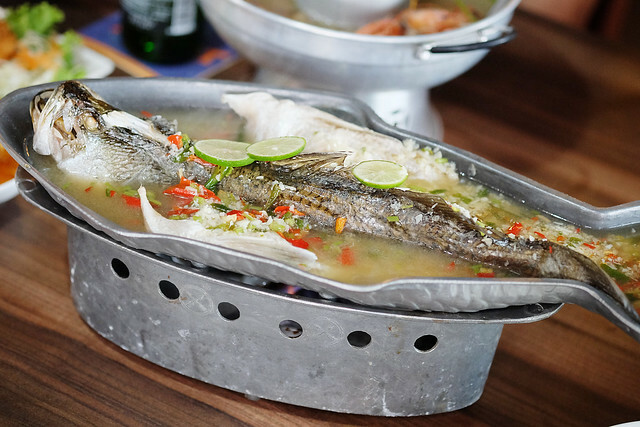 Thai Pavilion's Thai country-style spicy steamed Sea Bass. 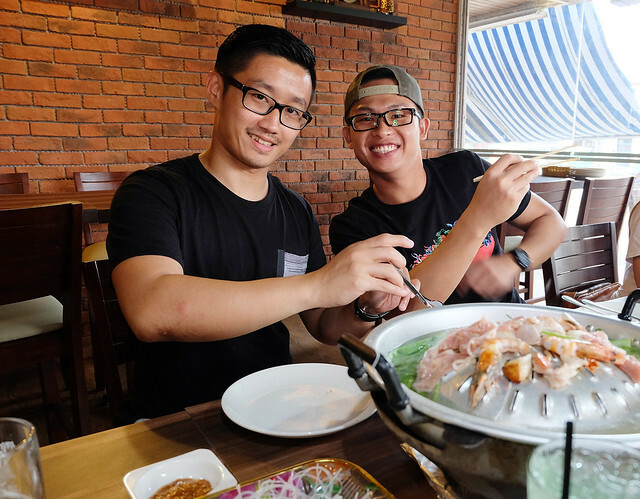 The fish meat was tender and succulent, it was perfectly steamed with a sprinkle of spicy lime sauce and fresh coriander. Every mouthful feels like there is a party in my mouth! This is my mum's favourite dish. 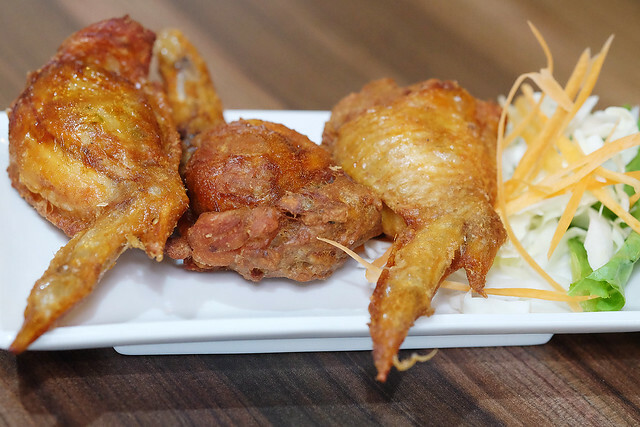 Thai Pavilion's Thai stuffed chicken wings which was served hot from the deep fryer. These legendary chicken wings have no bones at all! Makes me wonder how did the chef do it! 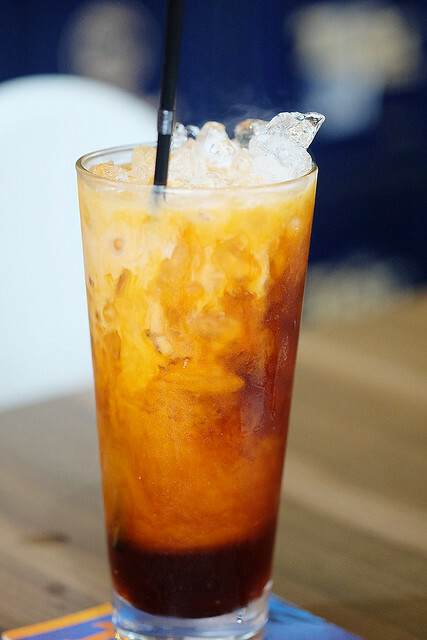 I had to order a glass of Thai milk tea to temper all the heat from the food. Thai Pavilion's milk tea tasted exactly as the ones from Chatuchak. Strong tea aroma and sweetened to my liking. 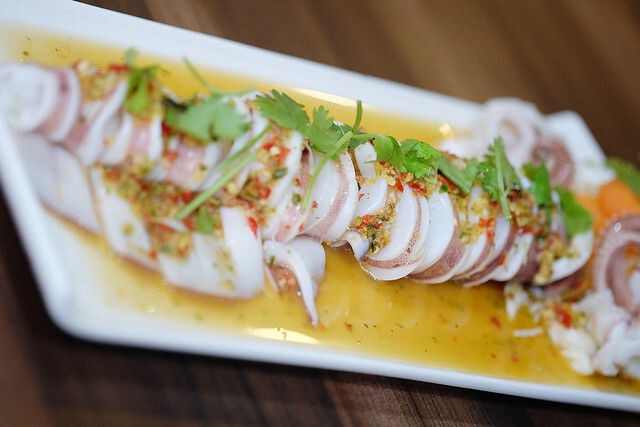 This next dish is the Thai Pavilion's famed "Steam Squid with lime garlic and chilli sauce". Very moist and tender and SOOOOooooooo flavoursome and SPICY! I felt like a dragon breathing out FIRE when I ate this one. And to round things up, we ordered some desserts to share. We were too FULL to each have our own dessert. 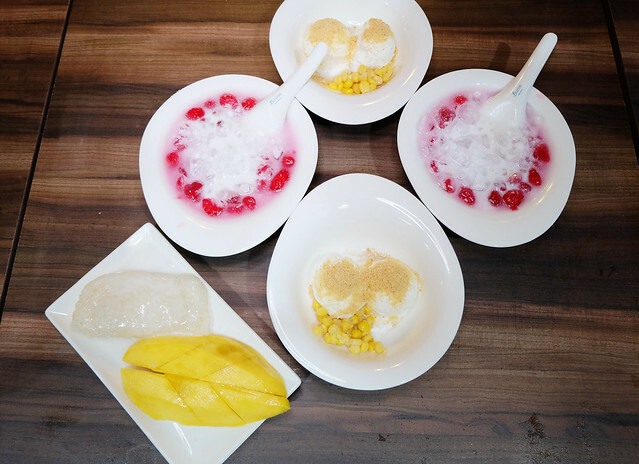 We had Thai red ruby which was a Thai dessert made from water chestnuts coated in glutinous rice flour and swimming in coconut milk. We also ordered the Chatuchak coconut ice cream with peanut, sprinkled with sea salt and peppered with sweet corn. This Chatuchak coconut ice cream is a MUST TRY! I loved it sooooo much! And of course, we needed to taste the Thai Pavilion's take on the Mango Sticky Rice. Perfect way to end our dinner. We met the owners of the restaurant so I took a photo with them! 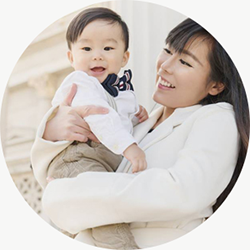 Their son is way tooooo cute and smart! He started walking at 10 months old. While I was taking this photo, my family were all watching the SG50 celebrations playing on Thai Pavilion's flat screen tv. Everyone was full and entertained. 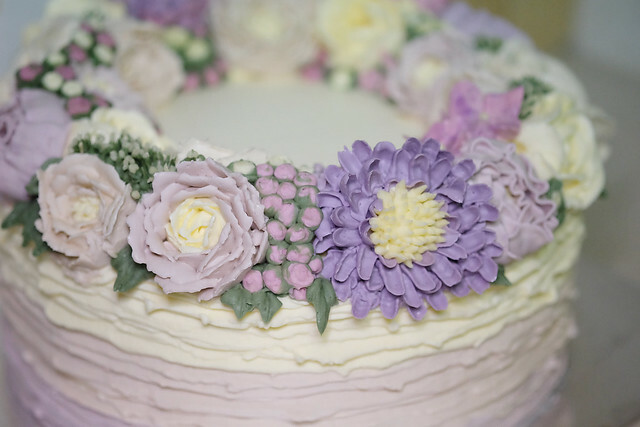 I also made a Korean buttercream floral wreath cake for my family. 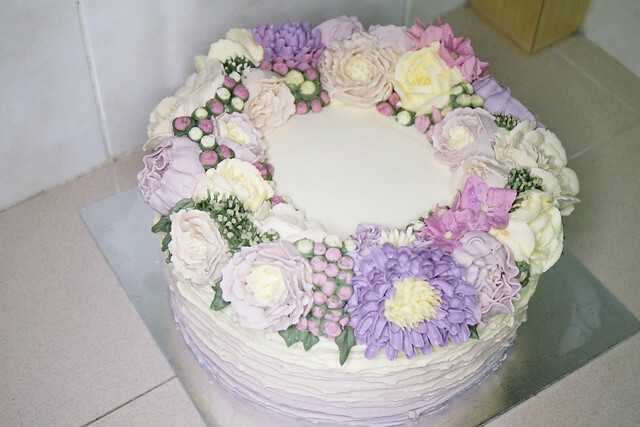 We ate this cake when we got home and I felt truly blessed to be a Singaporean. In summary, I like the Chef's presentation of authentic Thai food. All dishes were bursting with flavor and is so delectable. Everyone in my family had their own favourites and we would definitely be back for more. 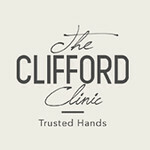 My mummy even took more name cards so that she can recommend this restaurant to her friends at work.